Only the best cookies ever. Beware, folks. These cookies may be vegan, but they sure aren’t diet food. If you ever spent a candy-full holiday hoarding Reese’s Peanut Butter Cups, these rich little gems are going to rock your sweet tooth hard. 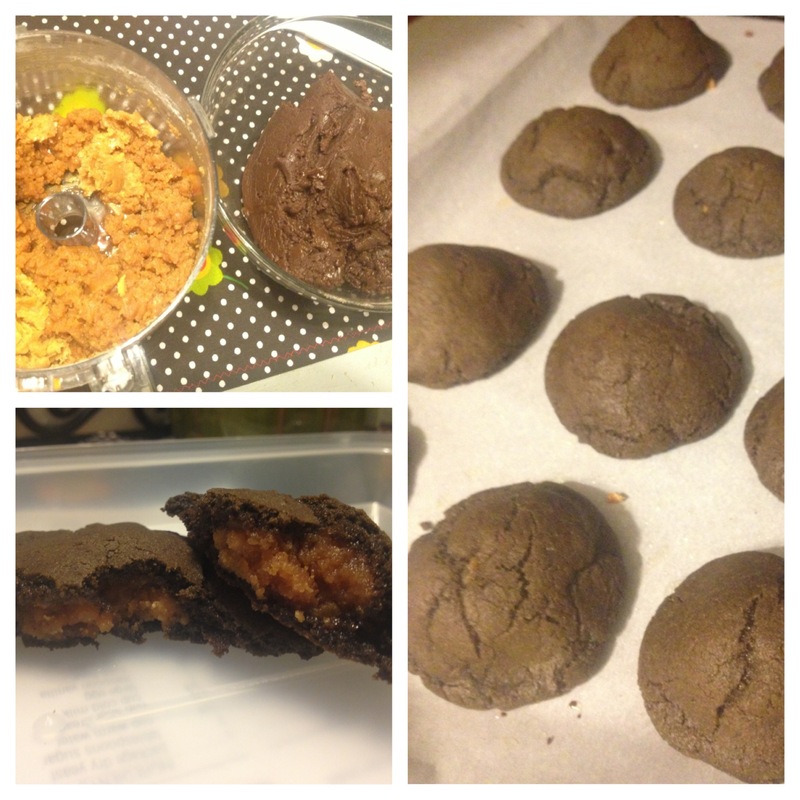 The recipe comes from the cookbook Vegan Cookies Invade Your Cookie Jar, with slight alterations, and is so fantastically simple and fast (especially with the aid of a food processor) you might find yourself making more batches than your waistline cares for. Just hide the scale now, that’s all I’m saying. Place the oil, sugar, maple syrup, milk, and vanilla in a food processor and process until smooth (or mix the ingredients in a large bowl). Combine the flour, cocoa powder, baking soda and salt, and gradually add the mix to the processor (or bowl), until a moist lump of dough forms. Dump the chocolate dough out onto a cutting board, bowl or clean counter and set aside. To make the peanut butter filling, process the peanut butter, powdered sugar, 2 Tbsps of milk, and vanilla until a moist, firm dough forms (if you are food-processor-less, use a hand mixer in a large mixing bowl). If your dough is dry and crumbly, add in the remaining tablespoon of milk. If it’s too wet, add in a bit more powdered sugar. By now your work space should smell amazing. Stop and appreciate that, then preheat your oven to 350 degrees, and line two baking sheets with parchment paper. Create the peanut-buttery soul of the cookies by rolling the peanut butter dough into twenty-four equal-sized balls. Tip: divide the dough in half, then divide each part in half again. Use those four chunks to make six balls each. To form your cookies, flatten about a tablespoon of the chocolate dough on your palm, and place a peanut butter ball in the center. Gently wrap the chocolate dough around the peanut butter center and roll it between your palms, smoothing any cracks, until you have a smooth ball of yumyum. Place all 24 dough balls about two inches apart on your lined baking pans, and pop them in the oven (one sheet at a time) for 10 minutes. Let the cookies stand for five minutes before scarfing them down…or moving them to wire racks or a plate to cool off. If you can somehow resist eating them all in one sitting, make sure you store these guys in an airtight container or plastic bag so they don’t dry out. Because that would be a damn tragedy. Next week, I promise you some tasty tacos. You can thank my wonderful friend Maggie for requsting that recipe. Until then, I leave you with this Twitter tip: If you are a Seinfeld fan, you must immediately follow Modern Seinfeld @SeinfeldToday. It’s a series of episode descriptions as if the show were still in production. Just imagine the shenanigans the gang could get into with iPhones, planking, hipster culture, etc. Enjoy! 😯… I’m definitely making some of these. You will not regret it. Enjoy! i love how its life changing cookies haha.. they look it! and sound it, anything with pb and chocolate is the besttt!